As many folks know, I try to send out quarterly updates on what's new at Benetech. Well, I just got my first one out in 2008! Regular Beneblog readers will know most of this, but it's always handy to pull it together all in one place. The Office of Special Education Programs (OSEP) of the U.S. Department of Education gave us a major award on September 28, 2007. This event was very exciting, as we have never previously received federal funding for Bookshare.org. I bet you're wondering what we must accomplish. In essence, we're being paid to deliver – free – accessible books to all students with print disabilities in the United States for the next five years. We will increase the number of students we currently serve by more than a factor of ten – in fact, our membership has already grown by over 20,000 users. We will also expand the number of books in our collection by 100,000 new titles. We’re sure we can do this because our technology allows us to cost-effectively and rapidly scale Bookshare.org. One example proves we’ll reach our goals. OSEP told us on a Sunday that we needed to start serving students for free right away. The next day, Monday, Bookshare.org was free to all U.S. students. In the first three months we quadrupled the number of students we serve! Now, all students and schools can achieve the level of success experienced by one of our student users, Tyler Norwood, a seventh grade student at the Corte Madera School in Portola Valley, California. 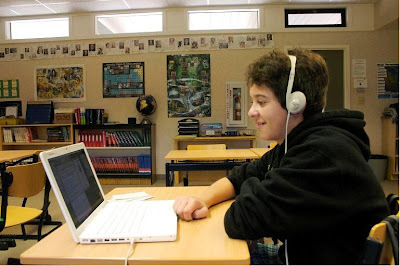 In this photo, Tyler is listening to a book from Bookshare.org on his school’s laptop with the assistance of the Kurzweil 3000 audio software. The Corte Madera School now uses Bookshare.org books in a range of classes for disabled students. The project has been so successful at raising student reading skills that they hope to provide similar services to their non-disabled students as well. I’m especially excited about our efforts to reach students who haven’t traditionally had access to assistive technology. Our vision is to put accessible books into the hands of disabled students on borrowed PCs or devices they already have, such as inexpensive MP3 players and cell phones. We want to ensure that every student with a disability no longer has the handicap of lacking textbooks or other important educational material. Our dream is to raise the floor for every person with a disability, to ensure access to the material needed for education, employment and social participation. You’ll be hearing more about this vision in the coming months. Bookshare.org isn’t our only project undergoing significant growth. Benetech’s newest project is a software tool called Miradi that helps environmental practitioners design, manage, monitor and learn from their projects to more effectively meet the needs of global biodiversity. Conservancy and the World Wildlife Fund), and began beta testing the software in 2007. The feedback has been amazing. We planned a typical beta test size of ten to twenty users, but had over 450 beta testers in more than 65 countries! This response is a measure of how eager the environmental field is for a tool that helps better manage projects. We’ve just launched Miradi. It is open source software, but we’re experimenting with a revenue model to sustain the project over the long term. Downloads, packaged with support, will cost $250 per user per year, discounted to $150 for nonprofits. People in developing countries will get further discounts. A pricing manifesto proposes that members of the community that can afford the software should support the project financially. If you’re interested in learning more or would like to download the software, visit the website at www.miradi.org. Patrick Ball recently spent a month at the International Criminal Court (ICC), where he held office hours and helped prosecutors use quantitative data and statistical analysis to pursue war crimes cases. Our HumanRights team, including Benetech Research Fellow Amelia Hoover and fieldconsultants Tamy Guberek and Daniel Guzmán, presented our initial findings on violations in Colombia to an enthusiastic audience of ICC investigators and analysts. We can’t share the details because of confidentiality provisions, but we look forward to continued close collaboration with the ICC to document the disappearances and homicides and demonstrate the magnitude, trends and patterns of these incidents. You can visit our Colombia Project Page to read more about this work. Our work in Liberia, funded by the State Department in support of the Truth Commission (TRC) continues. Benetech's Human Rights Program Manager, Kristen Cibelli, has just relocated to Liberia for at least six months. Kristen has been helping the TRC staff to develop a process that converts the qualitative information, contained in thousands of victim and witness testimonies, into data that can be used for quantitative analysis. We have just completed a new case study detailing our multi-year project with the TRC. We work with human rights groups all over the world. We’ve also had major efforts in Burma, Sri Lanka and Guatemala, to name a few; efforts we expect to continue this year. Our newest human rights project is looking closely at the human rights challenges in Darfur. Humanity United (founded by Pam Omidyar) funded this work. We are nearing completion of our assessment of Darfur-related NGOs and their qualitative documentation on human rights abuses. As part of the assessment, we researched the challenges faced by organizations working on the ground in Darfur and how different groups operate in the face of the risks. We found that groups working on documentation lack the necessary tools and methods to record and secure information in a systematic and consistent way. The information gathered by these groups was done so at great risk to themselves and to those whose stories they document, but it remains on paper or in insecure electronic formats. The result is that rich, raw data remains vulnerable to theft and destruction and cannot be easily used to support ongoing advocacy efforts. In addition, the collected information often lacks the level of detail required for potential quantitative analysis: the kind of analysis that might someday be needed in a forum like the International Criminal Court. We’ve identified key NGO partners that we believe would benefit from our technical assistance and are developing our plans and identifying support to continue our work on Darfur this year. Now, I’m delighted to report the recent arrival of our new Director of Marketing, Betsy Burgess. We’ve never had anybody dedicated to marketing at Benetech, and we’re excited about bringing this expertise on board! 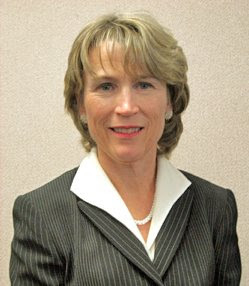 Betsy comes to us with a strong background in both high technology and the education field and will initially focus on getting the word out about Bookshare.org. Betsy, a former teacher with a Master’s in Education and Learning Disabilities, has a keen understanding of what educators need to adopt Bookshare.org and other technology in the classroom. She came to us with some very well-developed ideas on how to reach out to our educational users. During our recent campaign to recruit new team members, Benetech has attracted qualified candidates by offering more than just good pay and a pleasant work environment. Benetech is drawing top talent by offering Silicon Valley tech jobs with a social purpose. At a time when a growing number of people are looking for ways to help solve pressing social and environmental problems, Benetech’s technology initiatives for people with disabilities, human rights and environmental communities are striking a chord with job seekers. Benetech’s Human Resources Director, Jane Simchuk, says the humanitarian aspirations of job candidates have become a common theme since the company posted twelve new positions on its web site last year. Be sure to send our way great people you know who would be thrilled to find the social value of working at Benetech: our latest job listings are on our website. Making big impact with technology implies taking risks. Sometimes those risks don’t pay off. We had to confront this reality last year with our humanitarian landmine detector project. After a couple of years of trying to gain access to the military technology we had identified, we realized that this access was not imminent and suspended the project. You can read much more about the lessons learned from this effort in my Beneblog post and the report and essay to which it points. Route 66 Literacy was put on the back burner last year because it ran out of funding. However, we kept up the fully functional prototype website, which has been used by more than 800 people so far. We’re hoping to revive it with new funding, and have already committed to developing more content with our partner, the Center for Literacy and Disability Studies at the University of North Carolina at Chapel Hill. I’m looking forward to reporting on the latest from Route 66 Literacy on my blog and in future updates. Our team hopes to make a major impact on literacy and to meet the demand we see for this kind of tool. You may perhaps think that after winning a $32 million competition, we might slow down. Not Benetech! We are dedicated to making a bigger impact with all of our projects, so we’re developing more ambitious plans. Although we have ample funding this year to provide Bookshare.org to U.S. students with print disabilities, we want to expand the program to reach disabled readers around the world. I expect to find the funding we need to launch both Miradi and Route 66 as full-fledged projects rather than beta tests. Patrick, his team and I are also brainstorming about how to expand the impact of our Human Right Program on promoting better human rights globally. We are proud to bring our technology expertise to places where it is needed most and serve people who are working hard to make this a more just, equitable and peaceful world. And we are grateful we can count on our friends and partners like you to help bring about this vision. Thank you for your continued support, and I look forward to keeping you posted on our progress! Could you consider Readplease as an options for your Bookshare.org site which I am a member? Highlighting words as they are read. Pronunciation option is excellent for the education system when an acronyms such as PET can ask Readplease to say Positron Emission Tomography. Last which is of equal importance is speed to have a range which goes up to if not above 600 words per minute is important for auditory learners. Romans 10:9 (NIV) That if you confess with your mouth, "Jesus is Lord," and believe in your heart that God raised him from the dead, you will be saved.